All the Sunbird Aloes are drought tolerant. Even though they can go through long periods without water (you can go on holiday without worrying that everything will die) they are garden plants that will appreciate watering during dry spells in summer, and will flower at their best when given a little composted manure or organic fertilizer as a top dressing when rain can take the nutrients into the soil. Early- to midsummer would be the best time for feeding. Plants in containers should be given enough water to maintain some moisture in the container, but never when moist soil can be seen or detected by a little finger digging. 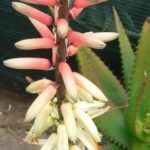 How much water do aloe hybrids need? Just for survival, actually, very little indeed. 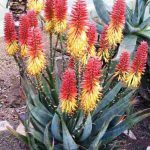 The Sunbird Aloes rockery has gone through periods of up to 6 months (normally in the winter) without a drop of water, without serious repercussions. Of course these are well established garden plants with quite a bit of reserve moisture carried in the leaves. As a general rule, the smaller the hybrid, the more often it will require watering. The very small pot plant sized aloes need some moisture where the roots are concentrated at all times. Watering periods will differ depending on the growing medium, the size and the location of the container, but they will probably need water at least once a week. As with many potted plants, over watering is always a bigger problem than too little water. 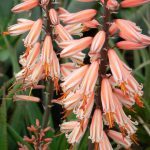 Newly planted aloes need more regular watering for a few months until such time as they are well established and the soil has settled. For aloes bought in nursery bags it would mean approximately 4 weeks of ensuring that the soil does not dry out completely. For open root plants (larger specimens grown in open soil are dug out and sold with exposed roots) an initial watering, to settle the soil, is needed. After that there is a waiting period of four weeks before any watering takes place, after that the same as for plants in bags. A big benefit of having aloe hybrids in the garden is that it is the one area where expensive sprinkler systems are not necessary. In times of severe drought as some areas are seeing now, a thorough watering once every three weeks for established plants will keep them going quite happily. This is simply done with a hose pipe and garden sprinkler. You can leave the plants unattended for weeks on end when you are out of town or on vacation, and still expect to see a flower display worthy of a tourist attraction come winter time. If you do decide to install a sprinkler system, just ensure that sprinkler nozzles are adjustable and movable and that watering times can be manually controlled.